In the Fila breed we can found different types, where the influences, in great or minor degree of the breeds of dog that formed the breed can be seen. According to the Dr. Santos Cruz’s theory, greatly accepted by all fanciers. 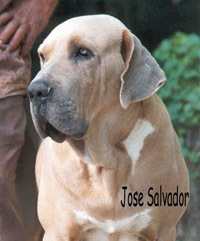 The breeds from where the Brasilian Fila was born are : The Old Bulldog, the Bloodhound and the English Mastiff. Cristovâo Giancotti, owner of the Tabayara kennel and Fila’s breeder since long time ago, speaks about a Fila’s classification that he arrived to in the 70’s, after careful studying and observing a lot of members of the breed. His considerations were published in the newspaper magazine Diario da Torre, in Belo Horizonte, in 1979. I am herewith enclosing the above mentioned considerations, as I think it is of a valuable piece of work for many. Prior to mention Mr. Giancotti’s work, I think it is a must to clarify that it is not a mix-breeding defence, not to mention a justification of the same. And Giancotti clearly indicates that all the dogs considered were totally typical with all thecharacteristics of the breed, such as the lack of stop, the inverted U of the lips, strong heads and of pear shape, well defined line between the supraorbital arcs, ears ending in rounded extreme, bulk, etc., thus typical temperament of the breed, and to prove all, he has no doubts in classify his own dogs, past and present, according to the three types mentioned. All these type variations are perfectly valid, that should be considered perfectly usable as far as genetics are concerned when talking about breed selection, as they are totally inside the Fila’s type. The fact that some breeders have addressed their breeding towards the Bloodhound’s look like type may have make many fanciers believe that this is the only correct type. But considering all the three types and judging them according to the standard, we can clearly see that all of them are inside what the standard consider to be the true breed type. Some of these types, rare nowadays, were to be current among the old strains that were the foundation of the Fila breed as we will see as follows. This a medium size dog, with moderate loose skin, big brisket and strong front, being this notably bigger that the rear part; even though the rear part is considerably thinner there will be no structural problems such as deviated pasterns or cow hocks. The skull of these dogs is of good length and wide, ending up with a shorter muzzle and not so deep, thus an ear of higher insertion than the other two types, and sometimes we can even see a type of rose ear. The neck is notably strong and powerful. Some faults that can be seeing in these dogs are barrel ribs, and undershot mouth . These dogs’ temperament is notably stronger than those of the other two. The vinager ash colour is more frequently seen, as it is also the white markings. Many of the Tabayara are inside this type (Vaimiri, Massaranduba, Rei, and so on ), as they were also some of the old Jaguaras, and many of the dogs of the classic Rondonia Kennel; Giancotti says that in the past there were a lot of this type of dogs in Uberlandia. The dogs belonging to this type are considerably bigger than those of the other types. The skin is looser than that of the Bulldog type though not in excess and strong bones. A good brisket and chest in proportion with the rear part, being the latter quite strong. The skull of less width than that of the Bulldog type, though not being thin. The muzzle of equal and sometimes longer than those of the Bulldog type, having, however, a bigger depth. Undershot mouths, can also be seeing from time to time. It is not rare to have a plain rib cage, causing the paws to turn a bit outside. Temperament is more sociable than those of the Bulldog type. Dogs of this type were those of the Sobrado Kennel, that were coming from the Parnapuán Kennel, through the Piraí Kennel, some of the dogs descending form Lord (of José Gomes), Gigante do Jaraguaia, Kuky dos Tabayara, an so on. Filas belonging to this type are of smaller size than those of the Mastiff type. In general they have good brisket, though they can show a thinner one more frequently than the other types , the rear part is normally proportioned with the frontal even though, dogs belonging to this type will show problems en the rear more often than the other two. 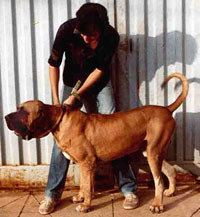 In this type, the skin is more abundant, the muzzle is longer, though, sometimes less deep, than those of the mastiff type, the skull is thinner, ears are longer and lower inserted and they will not normally have bite problems. In general dogs belonging to this type will have the less aggressive temperament of the three, being this type quite common nowadays, and also having been a classic in many of the old Jaguaras and in other Kennels, dogs such as Aga dos Tabayara, Tucaia da Jaguara and many others. At this point, I would like to comment, that these characteristics, herewith mentioned by Giancotti as typical of the Bloodhound type Fila, can be, sometimes, seen carried up to such an exaggeration that make the dogs loose the Fila characteristics of the breed. There are some Filas that present a number of physical details undesirable in the typical Fila dog : Those animals use to have less body and bone mass than the desired, and have insufficient chest and brisket, being originated by a plain rib cage, giving an outside hand opening as a result to that. Heads are normally thinner and longer, with skull loosing the typical “pear” shape, and ending up with one similar to that of the Bloodhound breed. The same can be applied to muzzles, that are longer and get thinner as they get to the nose. Please remember that according to the standard the Fila’s muzzle has to be “ thick under the eyes, narrowing a bit a the middle and thickening again towards the end ” “ with a nose that practically covers the whole end ”, considering a fault if not being like that. The typical inverted “U” of the front lips, sometimes changes to the undesirable inverted “V”. And in some of these animals the barking of the dog is different too, it is not the short bark from the throat but rather a longer and lasting, guttural sound that occasionally ends up in a type of howl typical of the Bloodhound breed. Another thing that can be observed is their change in the colour of the coat, where the colours do not appear clear, but with charcoal shades and also with dark masks as well as dark marks on the skull and over the eyes. The temperament can also be altered in these animals being sometimes more docile.